In the Blackmore-Night interview, I believe RB mentioned that he doesn't even have any of the DP recordings from the day (except for the gold plated ones on a plaque). It would be a real shocker if he showed up. He just isn't interested in wasting his time in the past - unless you consider the Renaissance period past. Press conference to be held this coming Tuesday... December 11th to announce inductees for the coming year. Announcement will be made at 11:00AM PT / 2:00PM ET from the Los Angeles’ Nokia Theatre, with the actual induction also taking place at the same venue on April 18th, 2013. Bummer Purple didn't make it in this time around... no surprise really, there's always next year! Thanks for posting the result, David. To be honest: neither did I expect it nor do I care. I've been through so much with this band, I love each member like family. Does family need a prize? No, I don't think so. I'm obviously super happy for Rush...but it's shameful that the other three made it when Deep Purple was on the ballot. Today proves how stupid the whole thing is. The less time thinking about it the better life is. It's embarrassing really, for the supposed Rock and Roll Hall of fame. It is a shambles/travesty that Deep Purple, who, along with Sabbath and Zeppelin, were instrumental in defining rock music, has failed to be inducted after all this time. This whole RRHOF is a joke. Certainly I would like DP to be in it. On the other hand they should've been in it many many years ago. So it would be strange to be indicted after so many years. For what reason would they be indicted? Their hey-days are long gone, maybe for their ongoing world tours? ...doesn't look too hopeful this time around either! The Fan voting results are in, which places Purple in 3rd place! 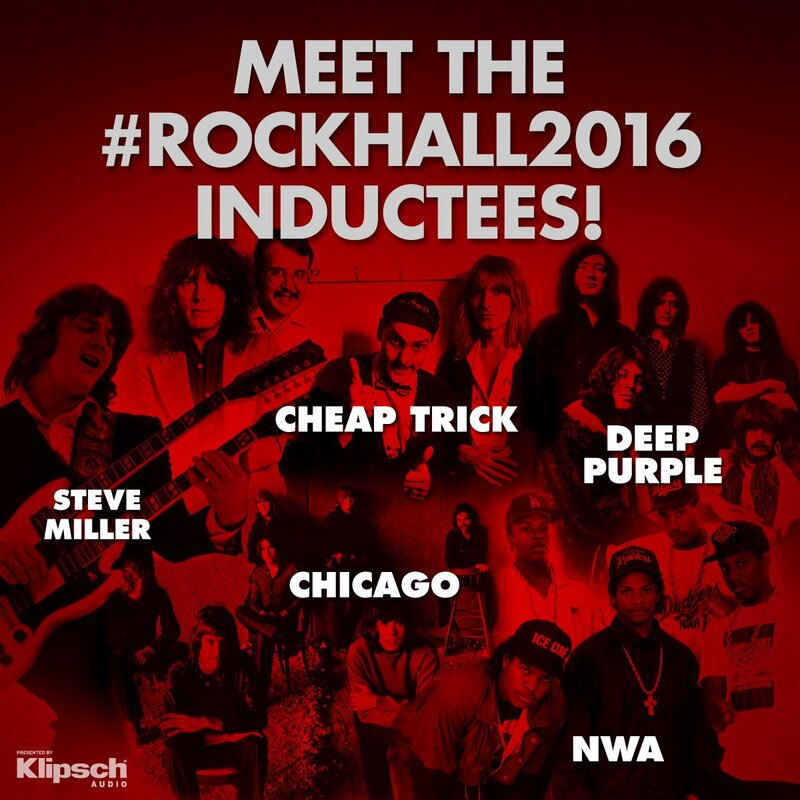 Deep Purple are once again a nominee for induction to the Rock & Roll Hall of Fame... others nominated include Cheap Trick, The Cars, Yes, Steve Miller, Chicago and 15 others! The 2016 Rock & Roll Hall of Fame Induction Ceremony will take place next April in New York City, and will be televised on HBO later in the year. I am so astonished that they haven't been inducted yet But I heard the news in September in Vienna and would love it if they were finally recognized! If there were a “Mount Rushmore Of Hard Rock” it would only have three heads: Led Zeppelin, Black Sabbath and Deep Purple. They are the Holy Trinity of hard rock and metal bands. Deep Purple combined outstanding musicianship with dozens of FM radio smashes. Three separate incarnations of the band have made spectacular albums culminating with Deep Purple In Rock, which along with Led Zeppelin II and Black Sabbath’s Paranoid created the genre of hard rock music. Deep Purple have sold over 100 million albums and their flagship track “Smoke On The Water” eclipses “Satisfaction,” “Born To Run” and “Smells Like Teen Spirit” as the Number One Greatest Guitar Riff Of All Time. It is the riff that inspired tens of millions of guitarists to pick up the instrument and only Beethoven’s Fifth Symphony gives it a run for the money as far as recognizability and badassed-ness. Genius guitarist Ritchie Blackmore fused countless powerhouse riffs with a deep knowledge and appreciation of classical music. Keyboardist Jon Lord kept pace on the classical and rock fronts and cemented the guitar/keyboard axis that defined the band’s sound, and along with Zeppelin and Sabbath gave birth to an entire genre. Ian Gillian’s vocal range was unparalleled and the boiler room rhythm section of Roger Glover and Ian Paice cemented the classic lineup. Original vocalist Rod Evans and the David Coverdale/Glenn Hughes lineups also created masterpieces of their own. Deep Purple are and were a band of supremely talented musicians and songwriters. They are one of the titans and pioneers of their genre, and one of the hardest pillars in the Temple Of Rock. Their groundbreaking albums and ear drum breaking live shows are the stuff of legend. NWA?! WTF!!!!! Congrats to Purple for finally getting in! Ian Gillan has officially anounced that he will not accept the induction in the Rock and Roll Hall of fame, because of the fact that Steve and Don are not included in the ceremony. Looks that he is a real friend and a rebel. Can someone explain why Rod Evans but not Nick Simper? More interesting - will he show up? In case you're on FB, why not ask 'Roderic' personally? I wonder who hides behind this account. I would be happier if Nick Simper and Tommy Bolin had been inducted as well. Then at least the first Purple decade MK1-IV would be complete. I think it's a fault in the press statement. I believe Nick Simper will be inducted as well. All times are GMT -7. The time now is 6:10 AM.